Welcome to our new Curiosities of Chinese section. This is where we look at Chinese idioms, sayings and expressions and try to explain their meaning and composition. This is not an attempt to teach Chinese but just a fun look at some of the fascinating parts of this rich language. The first in the series is one of my favourite idioms. Have you ever wondered that sometimes you are talking to, or explaining things to, people who just aren’t on the same intellectual level as you? Or ever wondered why the person you are talking to is so stubborn that whatever you say to them will never change their minds, no matter how right you might be? The Chinese have a perfect idiom to describe such a situation. 对牛弹琴 duì niú tán qín. 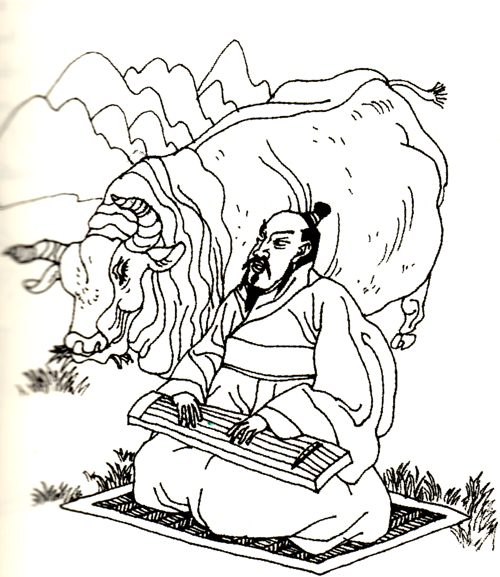 This literally means “playing the lute to a cow”. I really can’t sum up that frustration any better than this expression. is a general name for a stringed instrument but often refers to a traditional Chinese harp like instrument or lute. Gracias por enseñarme una nueva expresión en español. Me gusta mucho.